Tiger Woods sat back and said, “Well, what I did was pretty damned impressive, but that? Did you see THAT?” “That,” of course, was the most spectacular pipe job in NBA postseason history. 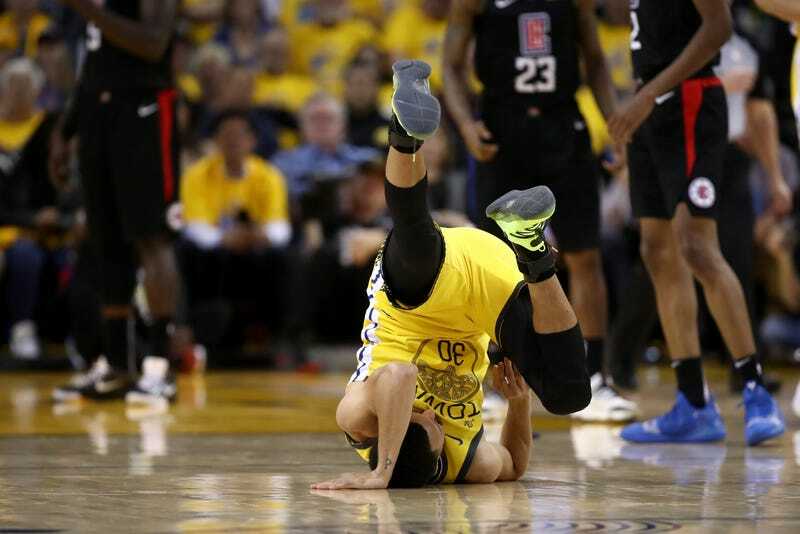 The Golden State Warriors not only blowing a 31-point lead in 19 minutes and 31 seconds, but giving up 72 points in those 19 minutes and 31 seconds was downright extraordinary—even by their own light-switch worldview. By the hilarious “on a pace to” universe in which we live, they played the final 19 minutes and change at a pace which would have ended with them losing a regulation game, 177-86. And still nobody thinks anything has happened except that they made their passage through to the Finals that much more difficult. Nobody, starting with them. What is more fretful for them is that DeMarcus Cousins could be done for the remaining postseason with what looked to the untrained eye like a shredded quadriceps. The Warriors just got an up-close look at how fleeting glory truly is, and how cruel luck can be when you give it half a chance to punch you in the larynx. Their duty is to recognize that they not only deserved to lose Monday night, but that its lessons should have been learned long ago. They won’t be, of course. This is a team that has mastered the art of playing as hard as it needs to for as long as it wants to, and for no longer than that. Their self-belief runs so deep and is so unshakable that the real punishment for this level of sloth has not yet been felt because they still believe, and probably correctly, that they’re still the best team in the field. There is, however, less sense that they can stop a flood once it breaches the levee, because this isn’t the first time this has happened to them, or more precisely not the first time they have declared victory before the other team was convinced to declare defeat. For all their skills, for all their versatility (hello, Draymond Green), for all their reputations piled atop each other in a gigantic tower overlooking the entire continent, they still have the one bad habit—thinking they scare the hell out of people who don’t scare as easily as they used to. The Los Angeles Clippers are an ornery bunch, the kind of neighbors who would rather argue that they are perfectly dry while drowning in the local pool than admit they could use a floatie and a quick tow to the side. Much of the credit for this attitude has been given to Patrick Beverley when in fact it has infected the entire team, and though it is easy to dismiss them, it is not easy to chase them off. Without question, they won this game, righteously and with great glee, and did it while running a porcupine in reverse right down the Warriors’ collective back. It doesn’t mean that games 3 and 4 will go that way, of course. The Warriors have spit up a few postseason games in their time, including the one in 2017 when all they needed was a win over Cleveland to become the first team to go 16-0 in the playoffs. They lost by 21. Yeah, here’s your legacy, kids. But the law of big numbers says this will not matter in the long run. In the world most of us live in, they will slap the Clippers down in Los Angeles once, win the other game by a modest margin, and maybe even finish the series back in Oakland, once the court is hosed off, broken up for kindling and replaced. The Warriors have lost in galling ways in other playoff games; happens to them all. Still, DeMarcus Cousins. As much as he put into his comeback, for emotional fulfillment and peace of mind as well as for material gain, this was the cruelest forfeit of all—a reminder that fate is a hell-weasel even for the well-intentioned, and that every wasted moment is a moment lost forever. He deserved better than this, whatever the news. The Warriors, though, deserved exactly this, this way, and in front of their fans, where the Windex in the wound stings most of all. They’ve been spitting into the wind too many times to keep shrugging them off as mere bug splats on the windshield on the road to glory. You root for them or against them; makes no nevermind to me. But this was their most ominous moment in the championship era, even worse than missing all their shots in the final five minutes of Game 7 in the 2016 Finals. This was the time when their most egregiously bad habit—declaring victory from the exit polls and then forgetting to vote—shoved a finger in their eye up to the second knuckle. Horrible games happen all the time; squeezing an entire horrible game into a quarter and a half doesn’t. Not to teams that truly get it. You may now resume your rejoicing, because we know that’s exactly who you are. Ray Ratto thought giving the 14 was a bit much, but not THIS much.